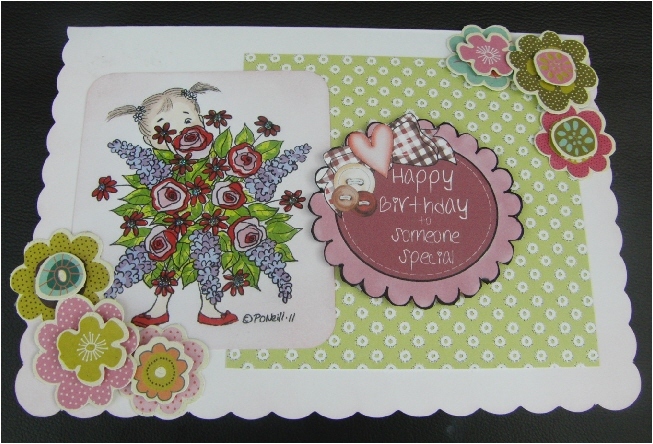 Hi everyone hope you are all ok ,well i have had a awful mess in my craft room and i am half tidied again ,its so hot that i cant face anymore .My Card for Phindy challenge over at paper craft planet ,we had to use die cut and i used die cut flowers . Love those flowers you diecut, the image looks BRILLIANT in the colours you used, love it! Thank you for joining in with this week’s Phindy’s Place Challenge, do hope you’ll play again this Friday! Fairy, I love this card. I especially love the bold coloring of the flowers that make the little girl peaking out of them that much cuter. Those flower embellies are wonderful along with the sentiment on the darker paper.